I still occasionally get e-mails from clueless readers who believe that the Earth is so big that it can absorb practically any injury or insult to its biosphere and somehow, magically, everything will be O.K., because the Earth can always repair itself; Nature can heal and everything can go back to the status quo ante. Indeed, I used to work with a woman who thought like that. In her mind the ocean was so big that nothing humanity did could ever truly hurt it. I don't know how people come by such staggering stupidity. Is it the chemical additives in the food? Fundamentalist Religion 101 for Dummies? The arrogance of post-industrial civilization? Too many hours at the mall or in front of the TV ? I don't know, but it is awfully disappointing, because humanity and the world are paying a very heavy price because of it. There are myriad millions of people who have that mindset. I don't know how much longer we can stumble along carrying the heavy baggage of so many willfully stupid members of the human race. The environmental crisis has so many ugly dimensions: rampant deforestation, industrial chemical contamination of the environment, chemtrails, overfishing of the seas, genetic modification of a growing number of species, petroleum industry fracking, honey bee die offs, massive garbage accumulation in the oceans, coastal wetland destruction, radioactive contamination and bio-accumulation of radioactivity in the biosphere. And much more. At a minimum humanity needs to deal with every single one of these issues if the Earth is to remain habitable. As of now, we have not come to terms with any of these problems. It is as if the terrestrial human species has a self-destructive death wish. So it is therefore no great surprise to me that right now there is a big die off of wildlife in the western USSA. It's inevitable given the assault we have mounted against the natural world. The ongoing nuclear crisis at Fukushima, Japan has badly poisoned the Pacific Ocean and there will be Hell to pay for that. By the looks of it, Hell has already begun to arrive. What we are seeing now are but the preliminary stages of the death rattle of a very large portion of the biosphere in the Pacific Ocean and adjacent territory, at least from Baja California, Mexico all the way up to Alaska. The nuclear death may ultimately extend to virtually the entire Earth. All because of one failed nuclear power plant complex in Japan. Now consider that there are more than 400 nuclear reactors, most of them in the northern hemisphere. All of them are susceptible to catastrophic failure. I don't see how we get out of this Nuclear House of Horrors that we have constructed for ourselves. But we must, if humanity is to go on and continue to thrive on this planet. The alternative is that we go extinct, probably before this century is over. Nuclear technology is diabolically deadly and if we don't completely get rid of it and fast, it is liable to completely do us in. The nuclear reactor explosions and meltdowns at Chernobyl, Ukraine and Fukushima, Japan have shown that we just cannot handle nuclear technology. We cannot cope with our own technological creations. They are beyond our control. So we have to shut them all down before they shut us all down. It really is that simple. I don't see any middle ground. Either we do it or we don't. As luck would have it, at this perilous juncture in history, we are cursed with leaders like this and like this. Click on the links. Does Hillary not look like the very embodiment of the Wicked Witch of the West, as if some dark force has taken over her dried up, hag body and animated it for its own demonic purposes ? Similarly, the Obama illustration neatly epitomizes who he is and what he really does. 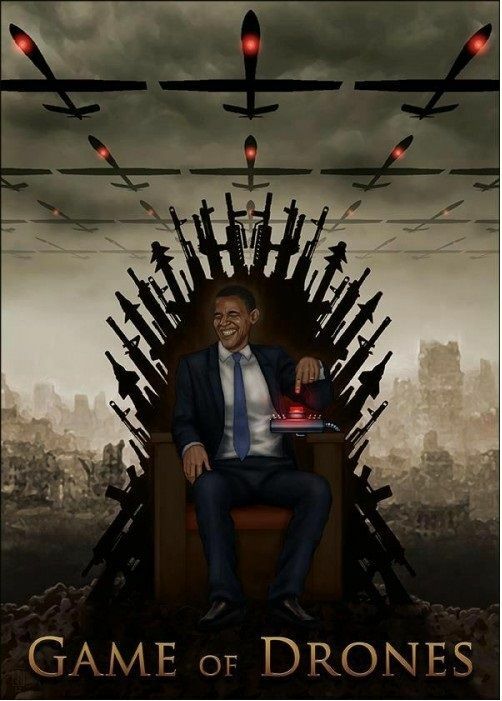 He blithely O.K.s a weekly kill list of people to be obliterated by drone attacks in countries on the other side of the world -- Somalia, Yemen, Pakistan, etc. This information is publicly known and yet he does it without shame or apology. 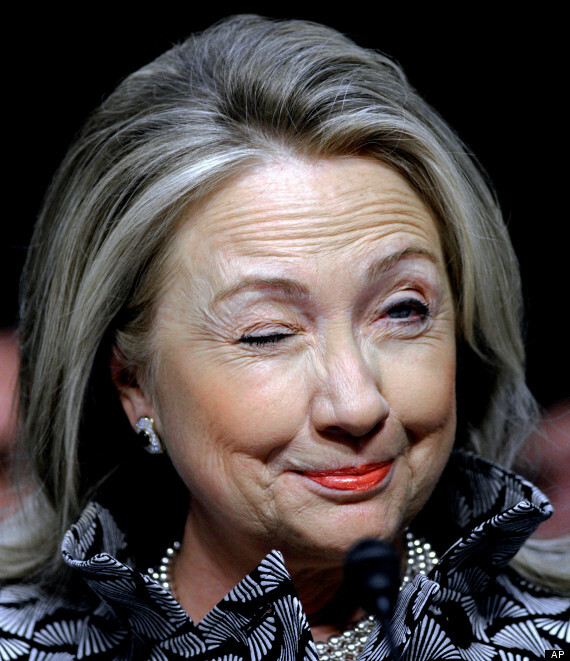 Both Hillary and Obama are like demon ghouls out of a hideous, dystopian, ayahuasca nightmare. We desperately need ethical, enlightened, humane leaders with training in ecology, with understanding of pressing scientific issues and global power dynamics, people who speak multiple languages and have broad experience with different sectors of world society and the global economy. Instead we get the dregs of the Ivy League, the sociopathic riffraff from Princeton, Brown, Columbia, Harvard and Yale. People like the Clintons, the Bushes. Obama, Kissinger and Bernanke. And they are very, very bad people, make no mistake about it. They are extremely dangerous beings on the loose. The USSA dollar continues to die. I have written about this before, and probably will again. It's such a momentous event that impacts literally billions of people, that it's hard to blog and not comment on it. I have readers all over the world and the dollar death is inevitably touching every last one, directly or indirectly. For the better part of a century, the USSA dollar has been the world's reserve currency, universally used in international trade and respected for its reliability. But you can forget about what used to be, you can forget about what most of us have known for most of our lives, because it's all just about to go bye-bye -- and it won't be back. Paul Craig Roberts. Ronald Reagan's Assistant Secretary of the Treasury has been writing for years about the dying USSA dollar and the collapsing USSA economy. His latest commentary is entitled simply, The Dying Dollar. The Chinese have absolutely figured out that the USSA dollar's days are numbered, and have announced just in recent days that they will begin dropping the dollar. The Chinese have a huge economy, and conduct a lot of trade with the USSA, so this is no small policy change. It will have real world consequences for the dollar. Yes, that's what it says. The three remaining, essential pillars of American power will disappear in 2014 and result in "considerable global upheaval." No one can say with precision what that will entail, but what is coming will assuredly be greatly different from what has gone before. The course of world events has reached a major inflection point and big events are preparing to transpire. Probably that is why the CIA is collecting massive data on the global flow of money transfers. It is one more attempt by the American power establishment, probably ultimately doomed, to maintain control of the international monetary system that it has dominated for almost a century. The greedy banksters and their spy agency lackeys will fight to the bitter end to continue lording it over humanity, to the very last nickel and dime. It is their larcenous, violent nature to do so. It's in their blood. They can't help it. However, there are those who beg to differ and who are even now setting up an alternative, global financial system that uses Bitcoin. I have written about Bitcoin before and probably will again. To start with, its value has increased roughly three-fold since my last blog post. That's another way of saying that smart money is fleeing fiat currencies like the USSA dollar and moving to Bitcoin, pushing its price up. So why don't we all have 100 Bitcoins? Well, I would were it not for my reduced financial circumstances. I've never been able to get ahead enough to be able to invest, to buy the lows and sell the highs, and make a profit in the markets, be it gold, silver or Bitcoin. This year has been the most difficult year of my life, so that is even truer now than in past years. Be that as it may, through an unanticipated causal chain of events I had a sudden realization and went looking for sites that provide Bitcoin for free, or nearly free. It turns out that those websites do exist, at least for now. I don't know how or why their owners are giving away free Bitcoin, but they are. They give away small fractions of a Bitcoin at a time, but it is real Bitcoin and over time it adds up. Max Keiser thinks that Bitcoin is poised to become extremely valuable, and if he is right, those who have even a fraction of a Bitcoin will be better off than those who have none whatsoever. So why waste any more time? You can have as many wallets (addresses) as you like or need. Ten or one hundred. It's up to you. But make sure you guard your passwords and account access carefully. Hackers abound in the online environment. Your Bitcoin wallet is just like your online bank account, your ATM password or the physical wallet in your pocket or purse. You have to keep it secure from thieves. Earn free .0001 bitcoin. It means just what it says. It's a one time deal. These three are also paying sites. I don't know the future of Bitcoin, but it is clear that the USSA dollar is dying. Something else will fill the void of its passing and for now it looks like Bitcoin is poised to be that something else, or at least one of the something elses. The physical healing of my body continues, but it is a slow recuperation. I have more strength, stamina and an overall higher energy level than before. However, my calves, ankles and feet are still extremely weak. I met with a traumatologist this morning and he has scheduled another round of MRI and tomography to image my ankles and spine. My body suffered very serious damage, including internal lesions that produced actual bubbles on my skin, so severe was the trauma. I cannot begin to describe how intense the pain was at times. One of the things my assailant did was to inject me with a substance against my will, against my emphatic expressed refusal, but I was physically incapacitated at the time and was unable to resist the injection. It was like a scene from a B-grade horror movie. I have no idea what was in the syringe. Anything I might say would be speculative, but judging from the trauma I have dealt with for a full eleven months now, whatever it was was not good. It caused me tremendous harm. The prosecutor set up a psychological exam for my assailant, and not long after the exam the examining psychologist killed himself. The same psychologist was to examine me, too, but his sudden suicide put the kibosh on that. So I now need to go to another city to be examined by another psychologist. Of course I have to pay my attorney for that trip. He is with me every step of the way and it costs. But my observation is that in this world if you are involved in a legal proceeding you need the best legal counsel you can afford, or else you are at the mercy of the system. So I have a good attorney from a decent law firm. Actually I have two. In Latin America, legal proceedings tend to drag out for a year, or two, or more. It is the nature of the system. It didn't help that I was hospitalized and in bed for more than four months, not able to walk around and conduct my affairs normally. In any event, it will taker several thousand more dollars to bring my case to a conclusion that is satisfactory for me and will protect the interests of society: the jailing of my assailant and his accomplices. To be a shaman does not mean that you have carte blanche to do whatever you desire to those who come to you. There are ethical protocols and limits that absolutely must be respected. The motto for the shaman is the same as for the physician: do no harm. I was very grievously harmed and that is not permissable. So I continue my struggle for justice. If you are able and willing to assist me with a donation please contact me and I will tell you how to do that. I also accept Bitcoin donations, in any amount, large or small.